The leader of the Soviet Union, Stalin, has the entire country in his grip and rules through fear. Then he dies suddenly, throwing the regime into chaos. And creating a ruthless struggle for power. The creator of Alan Partridge, The Thick Of It and Veep is back creating mischief in the cinema. It may be eight years since the first time he took up the director’s chair for In The Loop, but Armando Iannucci still has politics in his sights. 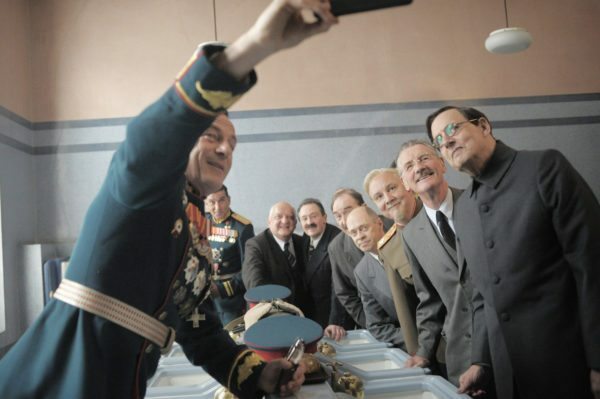 On the face of it, The Death Of Stalin may not sound especially contemporary, but all you have to do is give the surface just a little scratch. 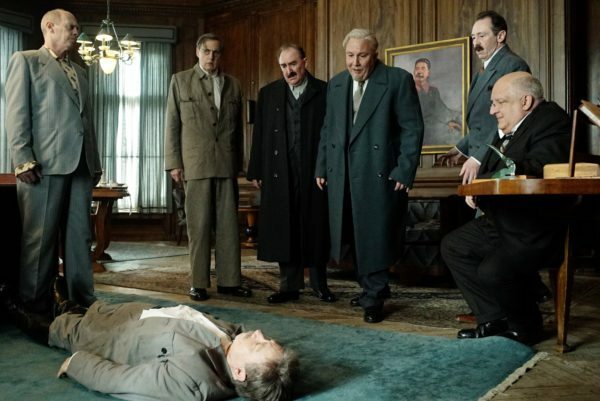 Needless to say, the film isn’t just about the death of the Russian dictator: we see the run-up to it and, most importantly, the aftermath: all the senior ministers jockey for position, with their eyes fixed firmly on the main prize – some more than others – while desperately trying to preserve their own lives at the same time. If they escape with that, they’ll be doing well. It’s intense, frantic and farcical, and chopped neatly into chunks with sub-headings taken from the Communist Party rules. They all cover situations such as what happens immediately after the leader’s death, who takes control, how decisions are made and, most importantly of all, how the new leader is chosen. While it paints a darkly ridiculous portrait of Russian politics at the time, the thought that Iannucci may be exaggerating can’t be avoided. 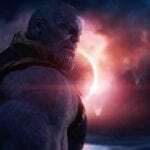 But he says much of the film is based on fact and, given some of the current political shenanigans, you eventually come to the conclusion that, once again, truth is stranger than fiction. 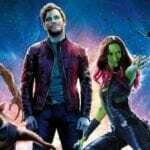 As far as the actual laughs are concerned, some that are smartly orchestrated and genuinely of the out loud variety, but there are plenty of others that will produce a knowing chuckle, a reaction perhaps more suited to satire. While In The Loop was patchy, this is closer to being consistently funny and all the more savage for being based on real events. 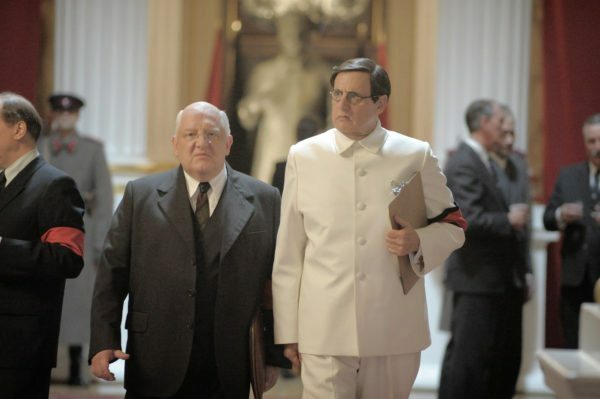 The main protagonist this time round doesn’t have Malcolm Tucker’s talent for invective, but Beria (Simon Russell Beale) is the ultimate manipulator and a skin-crawling creep. He also has the leader wrapped round any finger he chooses and is the master of compiling lists of people to be executed. The rest of the cast reeks of quality. Steve Buscemi, as a Brooklyn accented Kruschev, fast talking and decidedly unchuffed about being put in charge of the funeral arrangements. Jeffrey Tambor as Malenkov, the naïve, liberal and gullible second in command who finds himself reluctantly thrust into power, albeit temporarily. 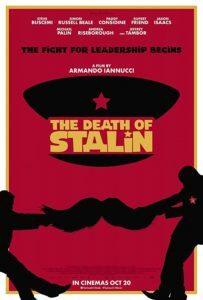 There’s out and out comedy turns from Rupert Friend as Stalin’s drunken son and Jason Isaacs as an outrageous Yorkshire accented general who knows no fear and has some of the best lines in the film. Iannucci has pulled off a tricky balancing act. Not only does his satire hit the target most of the time, but he’s also managed to combine his own style of dark humour and satire with something more akin to that of Monty Python. Perhaps the casting of Michael Palin as Molotov is no coincidence. Whatever, it all makes for comedy of the blackest hue, even if the prevailing colour is red.